The summer season is well underway in the world of yachting. The Cannes film Festival has been and gone and the Monaco Grand Prix is done and dusted. We’ve already done a few trips along the coast, from St.Tropez to Portofino and all of this cruising has been a reminder of what a beautiful part of the world the French Riviera is. The weather has been fantastic recently so I’ve been making the most of the beaches in Golfe Juan on weekends and after work taking a refreshing dip in the Med, relaxing in the sun and lunching at my favourite beach club, Open Plage. I almost feel like a local now. This is the time of year that we head south for a couple of months with the boat so I have been trying to spend as much time as possible with my friends before we all go our separate ways for the summer. The towns’ markets are full of colour and flavour. I’ve been obsessing slightly over rhubarb. I’ve made rhubarb and custard panna cotta, rhubarb tiramisu and even slathered some rhubarb compote over my yoghurt and granola for breakfast. I love the stuff! I like to stew it with a vanilla pod or two, a couple of cinnamon sticks and some honey and maple syrup. It freezes really well in an air-tight container so that you can savour the flavour in weeks to come. 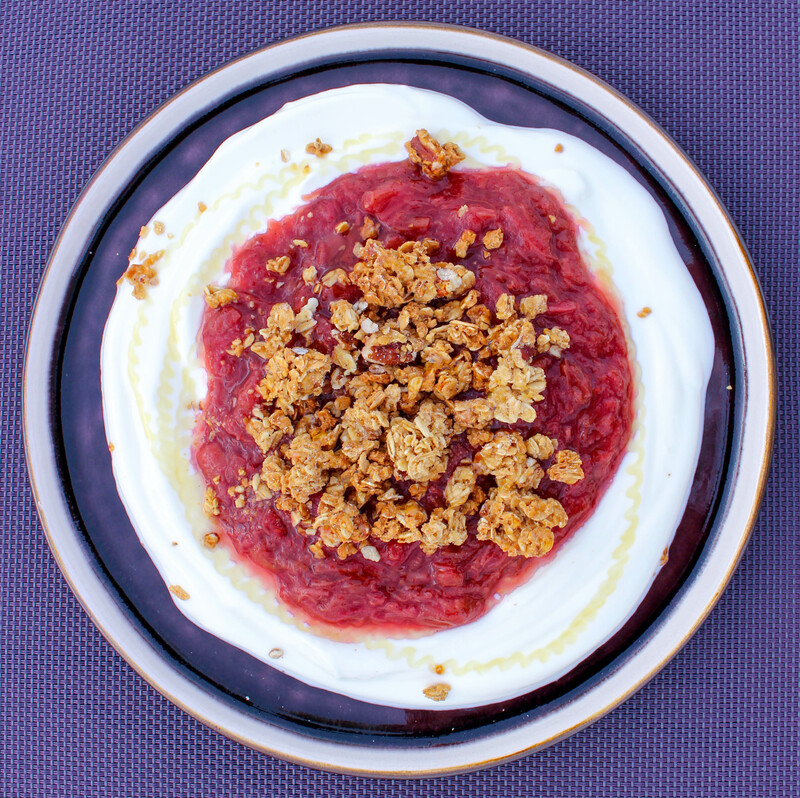 Rhubarb is very nutritious and is high in fibre helping to keep our digestive systems healthy and contains vitamin C, vitamin K and many other nutritional compounds. 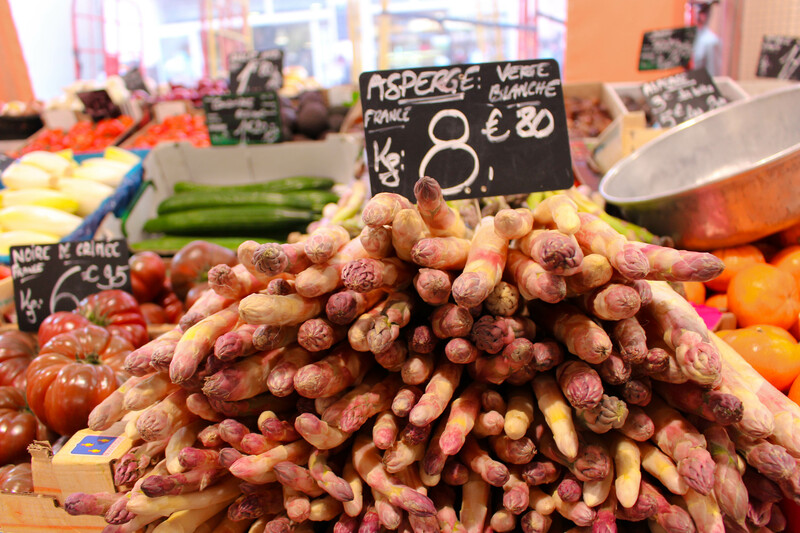 Asparagus is my favourite vegetable at the moment and there are so many varieties at the markets. 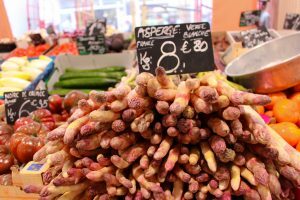 One lady at Marche Fortville in Cannes was selling purple and green asparagus ranging from bunches of very fine tips to the thickest tips I think I have ever seen. The thicker tips tend to be more expensive but I much prefer the finer, thinner tips. I like to buy a bunch of both green and purple and dry grill them on a hot plate on my hob, just enough cooking to char the asparagus which enhances it’s flavour then dress it with some good quality olive oil and season it with salt. Once charred, I slice the asparagus down its length exposing the white flesh inside. This method means the asparagus retains its crunch and is a great contrast with avocado in a salad with some eggs, crispy pancetta, or simply some rocket and Parmesan. 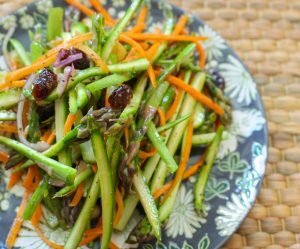 I love to make Asparagus Slaw too which always goes down well with crew and guests alike (click here for my Asparagus Slaw recipe featured above). I’m looking forward to the next couple of months, I think we’ll be quite busy but it’s nice to get away to see, to eat and to experience different things. It’s what draws most people to yachting I think. We’re very fortunate to be able to visit so many beautiful places. I love arriving at a new port in a different country where I will head off to the market to be inspired by the vibrant produce on offer. It’s those first couple of days in a new place where I feel most creative. I see something I haven’t seen or tasted for a long time and I’m eager to get back to the galley and get cooking. I will keep you posted along the way with photos on my instagram account (tiepot) and links to recipes on my facebook page (tiepotpage) but in the meantime you can follow the links on this page for my favourite asparagus and rhubarb recipes. 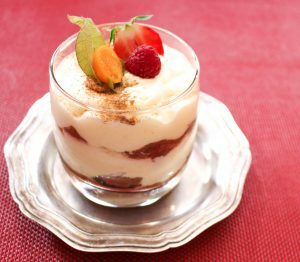 Please comment if you have any questions about the recipes or if you would like to request a recipe for a certain ingredient for future blog posts.